This is an unedited version of my article in the Village Magazine from June 2015. Three recent events, distinct as they may appear, point to a singular shared risk faced by the Irish economy, a risk that is only being addressed in our policy papers and in the mainstream media. Firstly, over the course of May, European financial markets have posted surprising rises in Government and corporate bond yields amidst falling liquidity, widening spreads and increased volatility. Secondly, both the IMF and the Irish Government have recognised a simple fact: once interest rates revert back to their 'normal' path, things will get testing for the Irish economy. And thirdly, the Irish Government has quietly admitted that the fabled arrears solutions to our household debt crisis are not working. Deep below the lazy gaze of Irish analysts, these risks are connected to the very same source: the massive debt overhang that sits on the back of our struggling economy. Take the first set of news. The problem of spiking yields and blowing up trading platforms in the European bond markets was so pronounced in May, that the ECB had to rush in with a bold promise to accelerate its quantitative easing purchases of Government paper to avoid an even bigger squeeze during the summer. All in, between January and the end of May, euro area government bond yields rose by some 6 basis points, cost of non-financial corporate borrowings rose by around 9 basis points, and banks' bond yields were up 1 basis point. All in the environment of declining interbank rates (3-month Euribor is down 10 basis points) and massive buying up of bonds by the ECB. In one recent survey completed by the Euromoney before May bond markets meltdown almost 9 out of 10 institutional investors expressed deep concerns over evaporating market liquidity (higher costs of trading and longer duration of trades execution) in the sovereign bond markets. In another survey, completed in late 1Q 2015 by Bank of America-Merill Lynch, 61% of large fund managers said that European and U.S. stocks and bonds are currently overvalued - the largest proportion since the survey began back in 2003. In the U.S., current consensus expectation is for the Federal Reserve to start hiking rates in 3Q 2015. In Europe, the same is expected around Q3 2016. And recently, both estimates have been moving closer and close to today, despite mixed macroeconomic data coming from the economies on the ground. If the process of policy rates normalisation coincides with continued liquidity problems in the bonds markets, we can witness both evaporation of demand for new government debt issues and a simultaneous increase in the cost of funding for banks, companies and the Governments alike. Which brings us to the second point - the role of interest rates in this economy. In recent Stability Programme Update (SPU) filled with the EU Commission, the Department of Finance provided a handy exercise, estimating the impact of 1% rise in the ECB key rate. The estimates - done by the ESRI - show that in 2017, a rise in ECB rate to 1 percentage point from current 0.05% will likely cost this economy 2.1% of our GDP in 2017, rising to 2.4% in 2018 and 2019. By 2020, the effect can amount to the losses of around 2.5% of GDP. This increase would bring ECB rates to just over 1/3rd of the historical pre-crisis period average - hardly a major 'normalisation' of the rates. Which means that such a hike will be just a start in a rather protracted road that is likely to see rates rising closer to 3-3.5 percentage points. But here is a kicker, the ESRI exercise does not account fully for the realities on the ground. In addition to the ECB rate itself, several other factors matter when we consider the impact of the interest rates normalisation on the real economy. Take for example cost of funds in the interbank markets. Average 12 months Euribor - prime rate at which highest-rated euro area banks borrow from each other - averaged 3.29% for the period of 2003-2007. Today the rate sits at 0.18%. Which means rates normalisation will squeeze banks profits line. If euro area, on average, were to hike their loans in line with ECB increases, while maintaining current 12 months average lending margins, the rate charged on corporate year and over loans in excess of EUR1 million will jump from the current 2.17% to 3.37%. 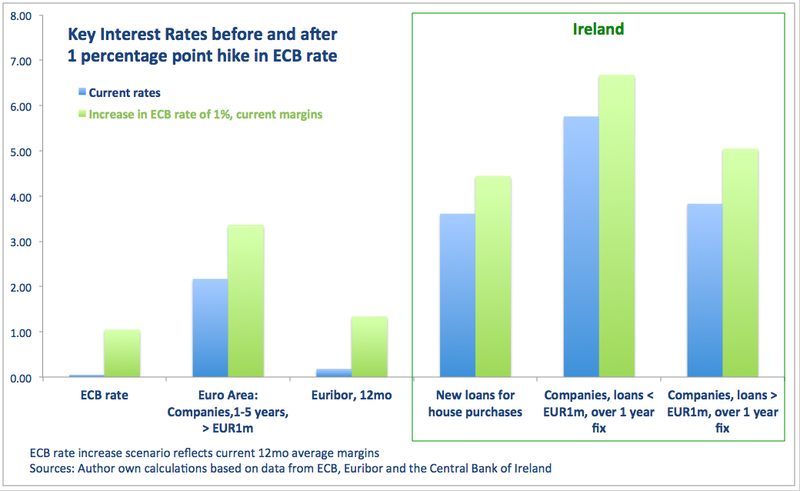 It turns out that due to our dysfunctional banking system, Irish retail rates carry a heftier premium than the euro area average rates, as illustrated in Chart 1 below. Which, of course, simply amplifies the impact of any change in the ECB base rate on Ireland’s economy. The reason for this is the pesky issue of Irish banks profitability - a matter that is distinct from the euro area average banking sector performance due to massive non-performing loans burden and legacy of losses carried by our banking institutions. Per latest IMF assessment published in late April, Irish banking system is the second worst performing in the euro area after the Greek when it comes to existent levels of non-performing loans. 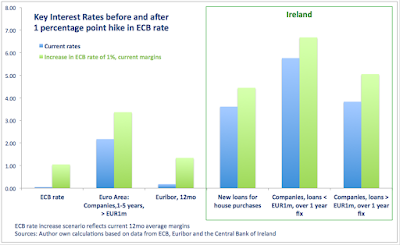 In today's terms, this means that the average lending margin charged by the banks in excess of ECB policy rate is 3.4% for house purchase loans, 5.63% for loans to Irish companies under EUR1 million with a fix of one year and over, and 4.0% for loans to same companies in excess of EUR1 million. Which means that a hike in the ECB rate to 1% will imply a rise in interest rates charged by the banks ranging from 0.84% for households loans, to 0.92% for smaller corporate loans and to 1.22% for corporate loans in excess of EUR1 million. Chart 2 below highlights what we can expect in terms of rates movements in response to the ECB hiking its base rate from the current 0.05% to 1%. No one - not the ESRI, nor the Central Bank, nor any other state body - knows what effect such increases can have on mortgages arrears, but is pretty safe to say that households and companies currently experiencing difficulties repaying their loans will see these problems magnified. Ditto for households and companies that are servicing their debts, but are on the margin of slipping into arrears. While the ESRI-led analysis does enlighten us about the effects of higher rates on tax revenues and state deficits, it does little in providing any certainty as to what happens with consumer demand (linked to credit), property investment and development (both critically dependent on the cost of funding), as well as the impact of higher rates on enterprise formation and survivorship rates. In addition, higher rates across the euro area are likely to imply higher value of the euro relative to our major trading partners' currencies. Which is not going to help our exporters. Multinational companies trading through Ireland are relatively immune to this effect, as most of their trade is priced internally and stronger euro can be offset by accounting and other means. But for SMEs exporting overseas, every percentage point increase in the value of the euro spells lower sales and lower profits. Across the euro area states, there are multiple pathways through which higher rates can drain growth momentum in the economy. But in Ireland's case, these pathways are almost all invariably adversely impacted by the debt overhang carried by the households and the corporate sectors. Current total debt, registered in Irish financial institutions as being extended to Irish households and resident enterprises stands at just over EUR263.7 billion. 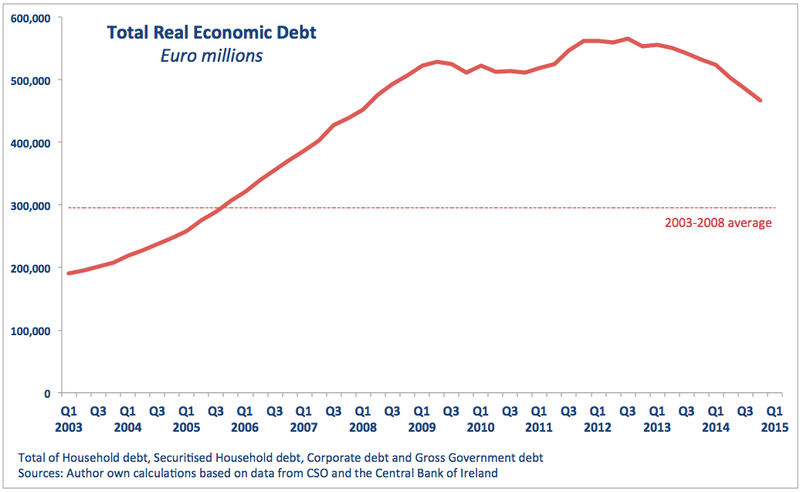 And that is before we take into the account our Government debt, as illustrated in Chart 3. 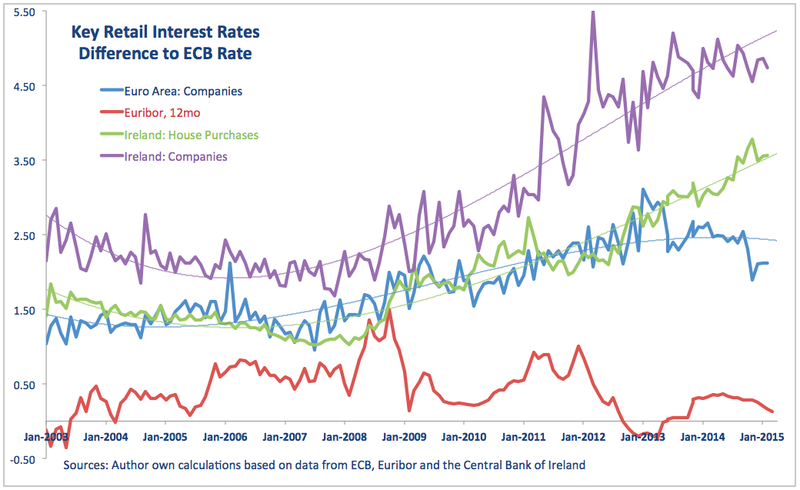 A 1 percentage point increase in retail rates can see some EUR2.64 billion worth of corporate and household incomes going to finance existent loans - an amount that is well in excess of EUR2.28 billion increase in personal consumption recorded in 2014 compared to 2013, or 24% of the total increase in Ireland's GNP over the same period. Add to that added Government debt costs which will rise, over the years, to some EUR1.5 billion annually. What is not considered in the analysis is that at the same time, rising cost of credit is likely to depress the value of the household's collateral, as property prices are linked to credit markets conditions. Which means that during the rising interest rates cycle, banks may be facing an added risk of lower recovery from home sales. The effect of this would be negligible, if things were relatively normal in Irish mortgages markets. But they hardly are. At the end of Q4 2014, total number of mortgages in arrears stood at 145,949 accounts, amounting to the total debt of EUR29.8 billion or 18% of total lending for house purchases. 94,929 accounts amounting to EUR14.94 billion of additional debt were restructured and are not in arrears. Roughly three quarters of the restructured mortgages involve 'solutions' that are likely resulting in higher debt over the life time of the restructured mortgage than before the restructuring was applied. We cannot tell with any degree of accuracy as to how sensitive these restructured mortgages are to interest rates changes, but arrears cases will be much harder to resolve in the period of rising rates than the cases so far worked out through the system. You'd guess that the ESRI and Department of Finance would do some homework on all of the above factors. But you would be wrong. There is no case-specific risks analysis relating to interest rates changes performed. Perhaps one of the reasons why majority of analysts have been dismissing the specific risks of interest rates increases is down to the lack of data and models for such detailed stress-testing. Another reason is the false sense of security. Take the U.S. case. The U.S. economy is now in an advanced stages of mature recovery, based on the most recent survey of economic forecasters by the BlackRock Investment Institute. But the underlying weaknesses in growth remain, prompting repeated revisions of analysts' expectations as to the timing of the Federal Reserve rates hikes. Still, the Fed is now clearly signaling upcoming rate hike. The Fed is pursuing a much broader mandate than the ECB - a mandate that includes the target of full employment. The twin mandate is harder to meet than the ECB's singular objective of inflation targeting. While the European inflation is low, it is not as low as one imagines. Stripping energy - helped by the low oil prices - inflation in the Euro area was estimated to be at 0.7% in April 2015. Combined, prices of gas, heating oil and fuels for transport shaved 0.66 percentage points off headline inflation figure. Although 0.7% is still a far cry from 'close to but below 2%' target, for every 10% increase in energy prices, HICP metric watched by the ECB will rise approximately 1.06 percentage points. So far, in April 2015, energy prices are down 5.8% y/y - the shallowest rate of decline in 5 months. Month on month prices rose 0.1 percentage points. Sooner or later, interest rates will have to rise. In the U.S., explicit Fed policy is that such increases will take place after the real economy recovers sufficiently to withstand such a shock. In the euro area, there is no such policy in place, in the aggregate, across the entire common currency area, and in the case of specific weak economies, such as Ireland, in particular.